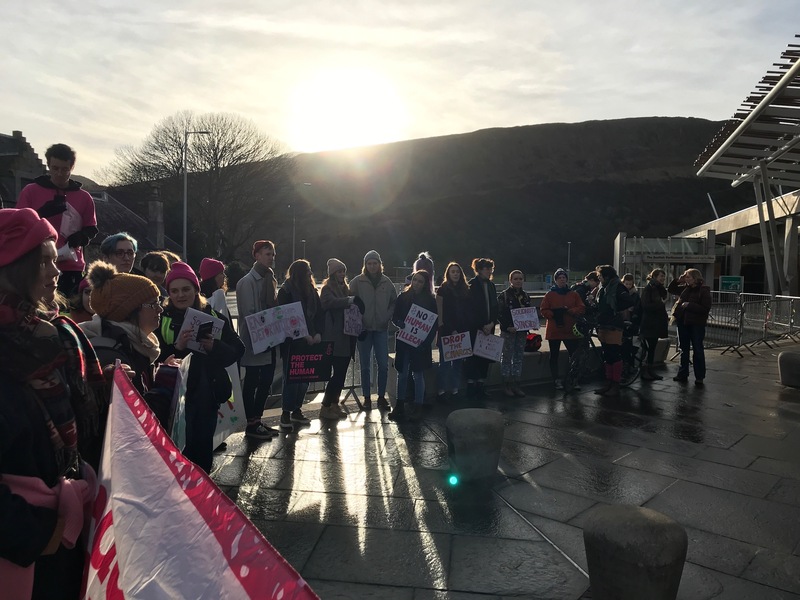 We were outside The Scottish Parliament on 6th February with Edinburgh University Amnesty International making sure the message was loud and clear: preventing a crime is NOT a crime. 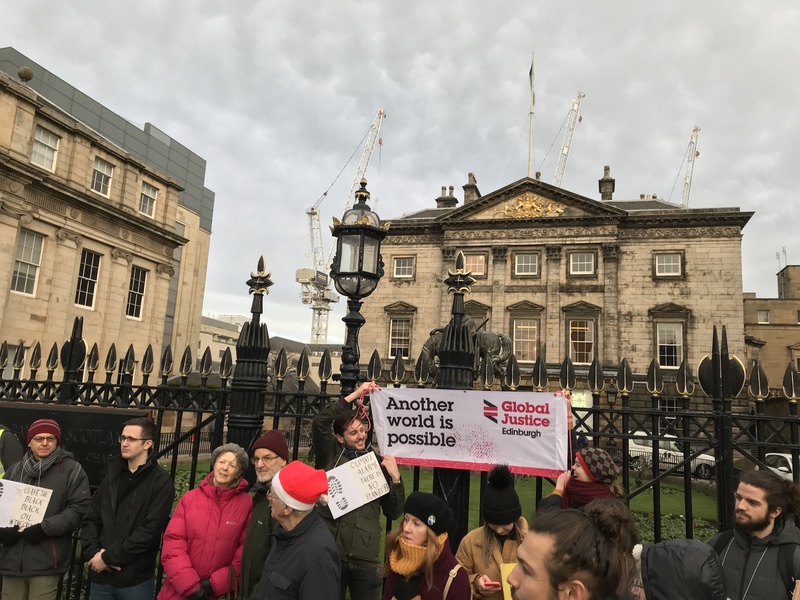 We stand in solidarity with the brave actions of the #stansted15. 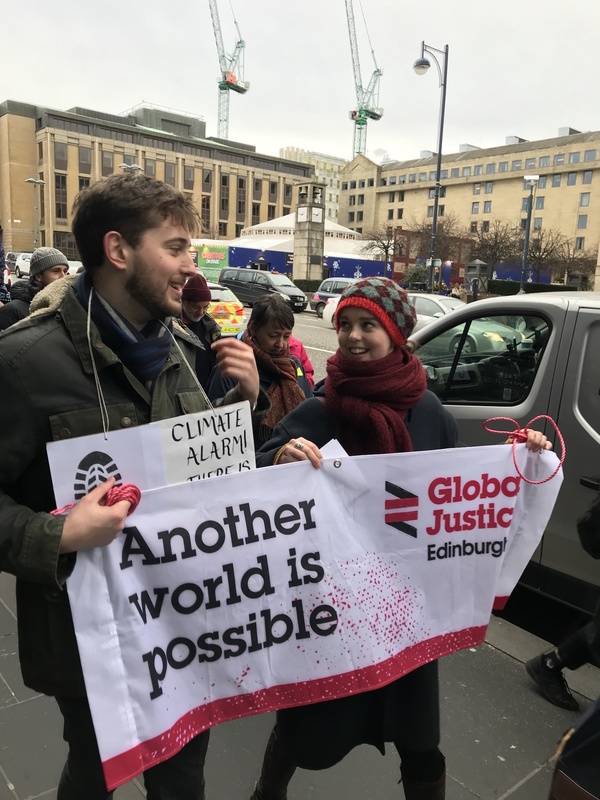 On a cold December morning we joined forces with Friends of the Earth Scotland and Extinction Rebellion Scotland, amongst others, to ring the alarm for catastrophic climate change and urgently demand governments and corporations to do more to act to prevent ecological breakdown. Starting off from the Usher Hall, we journeyed to the First Minister’s residence in Charlotte Square and finished outside RBS – making noise, demanding action and sounding the alarm all the way. 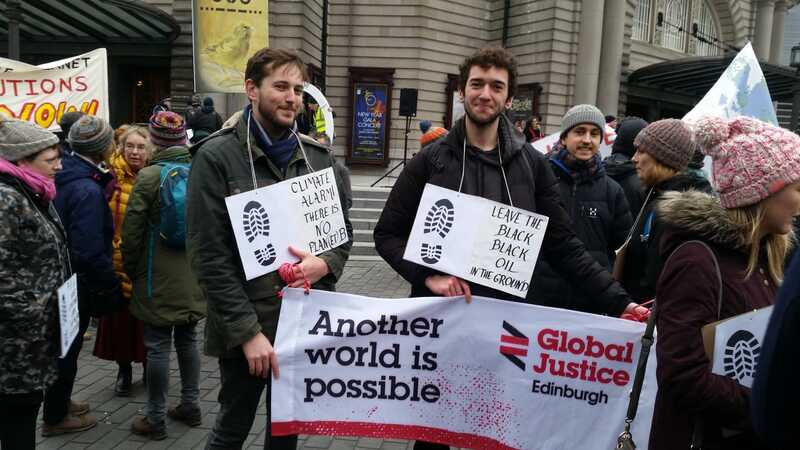 Global Justice Edinburgh supporters came together once again on the 15th September 2018 to kickstart their activism within the capital! 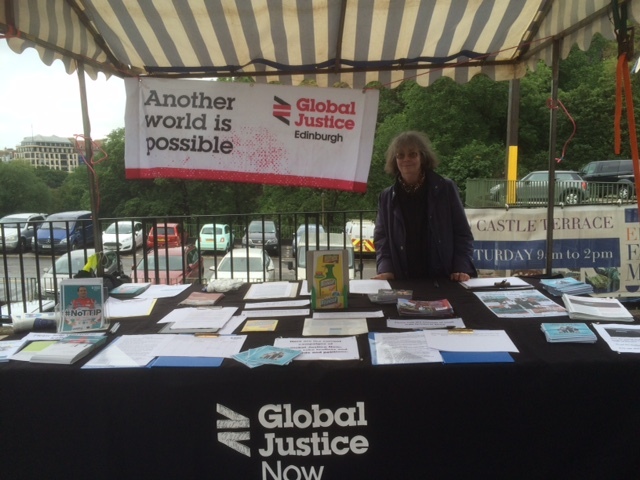 The group had a successful meet and greet at the Forest Cafe before moving on to mark the 10 year anniversary of the Global Financial Crash with other local activist groups. 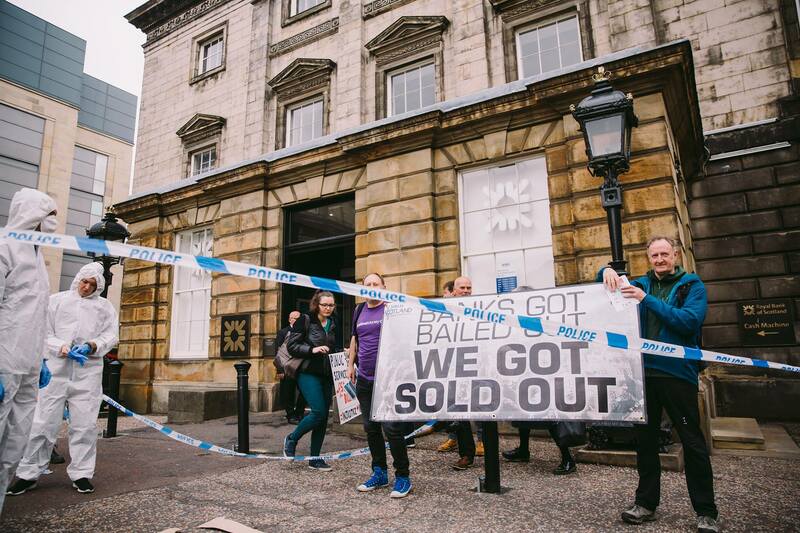 This action saw the group mark the 10 years anniversary of the Global Financial Crash and drew attention to the fact that whilst the public bailed out RBS to the tune of £45.5bn, we have seen nothing in return but austerity and billions in losses from government RBS share sales. 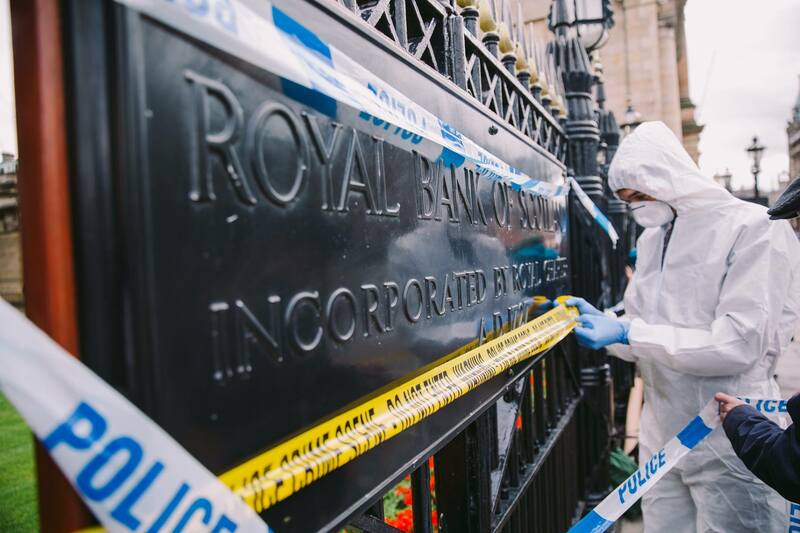 So, to make the point clear that we believe the taxpayer has been dealt a grave injustice whereas the financial system remains largely unchanged, we decided to help Jubilee Scotland in turning the RBS in St Andrew’s Square into a crime scene (pictures below).  Moving forward, this group will be open to absolutely anyone who wants to join in the movement towards a fairer world. Please follow our Facebook group or Twitter for more information or email gjnedinburgh@gmail.com if you would like to get in contact about joining the group and making an impact in Edinburgh and the Lothians! 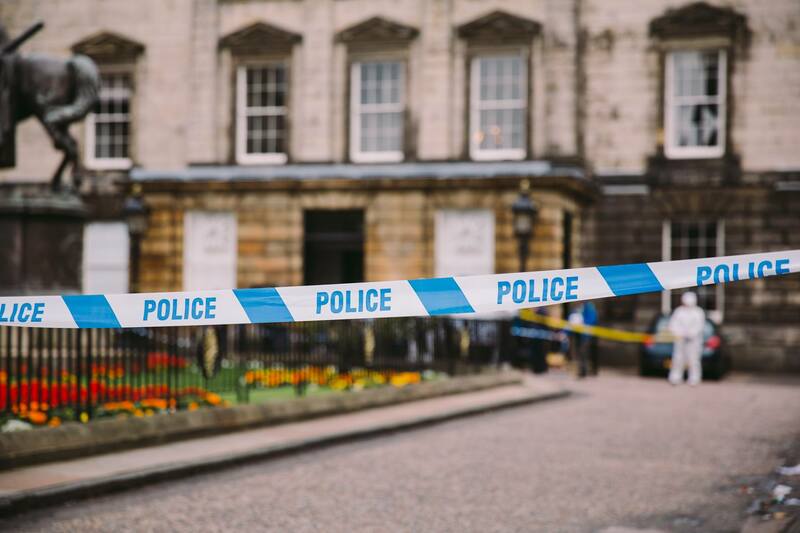 Be sure to join us at our next meet-up at The Forest Cafe at 6:30pm on October 29th. 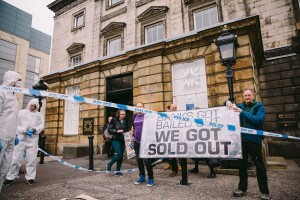 Anti-TTIP Robot Flashmob and Call-Out for More! 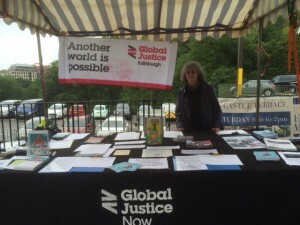 July 12th 2014 was the national day of action against the biggest threat to democracy in recent years. 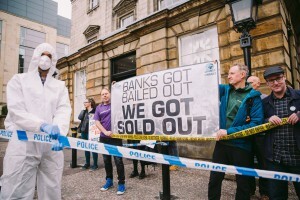 The Transatlantic Trade & Investment Partnership (TTIP) is a so-called ‘free trade’ deal currently being negotiated by the EU and US. This deal will give big business more power over our society, our environment, our public services, and our democracy. 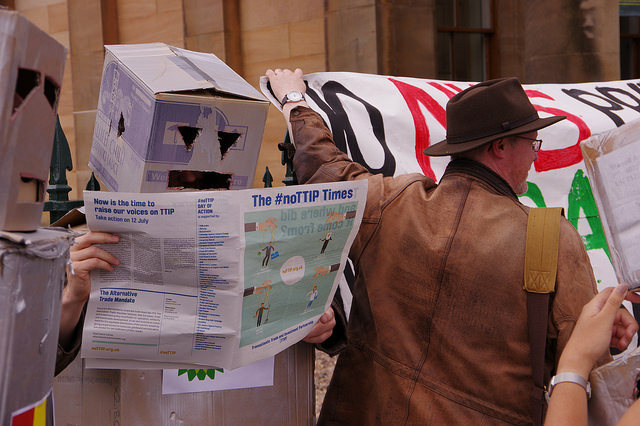 Negotiations on TTIP between the EU and US began in July 2013 and are still ongoing. 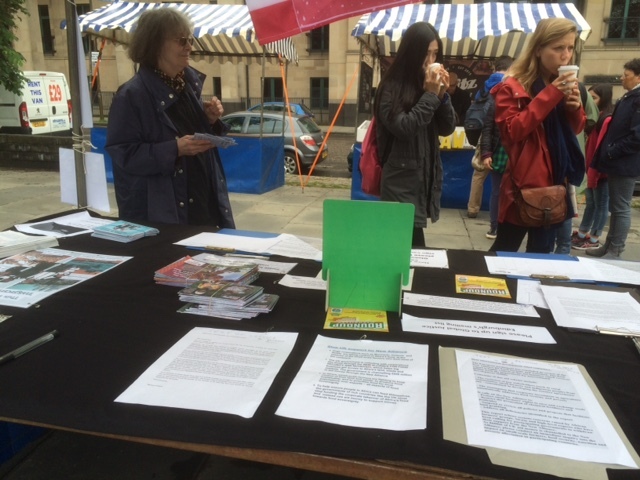 The sixth round of negotiations started on 14 July 2014 in Brussels, just two days after our national day of action. 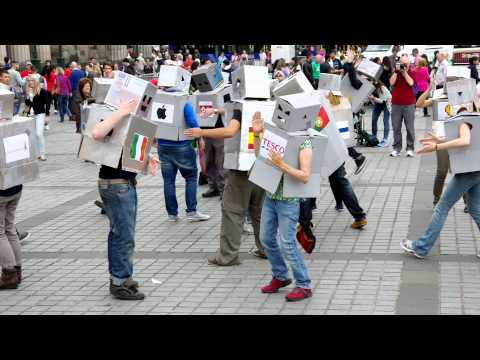 In Edinburgh, activists decided to have a dancing robot flashmob on the day of action, to depict the ‘fight’ between corporations and people in the EU and US. We made over 30 robot costumes and had many brilliant robot dancers on the day, both people invited to the flashmob, but also passers-by who wanted to join in! The robots were a great way to attract attention and people came over to watch the performance, so we got lots of action cards signed. 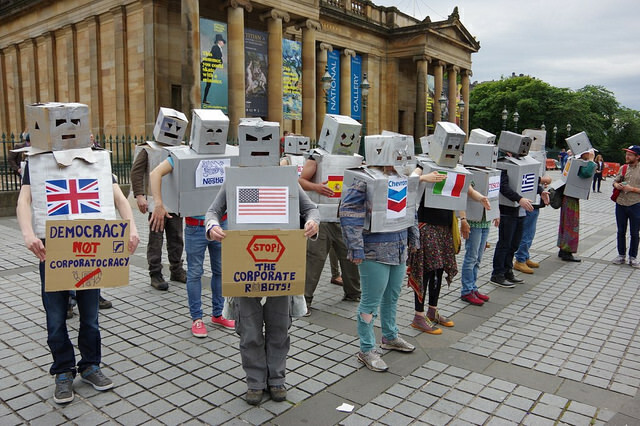 Coverage of TTIP has been minimal,because the biggest bi-lateral trade deal ever negotiated is going on behind closed doors, but a photo of the robots got in The Herald on Sunday. 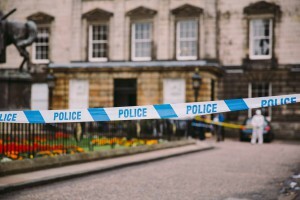 On Monday 14th July, an exclusive group of attendees convened for the sixth round of TTIP negotiations, intent on achieving ‘regulatory coherence’ between the US and EU. Alarmingly, the negotiating text has been hidden from the press and public, whilst hundreds of corporate lobbyists have access to both the text and the negotiators. 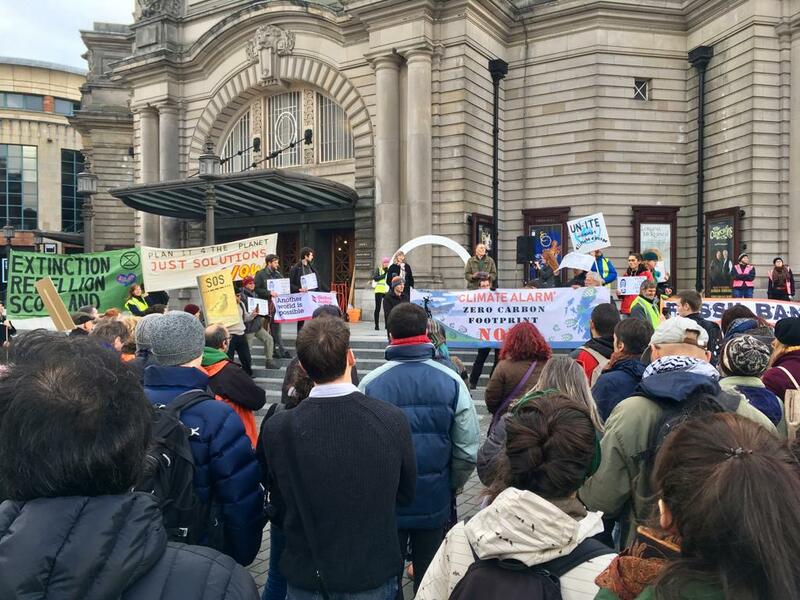 British American Business is organising a TTIP roadshow around the UK to ‘highlight to companies across the UK how they can benefit from a successful trade agreement between the US and EU’. 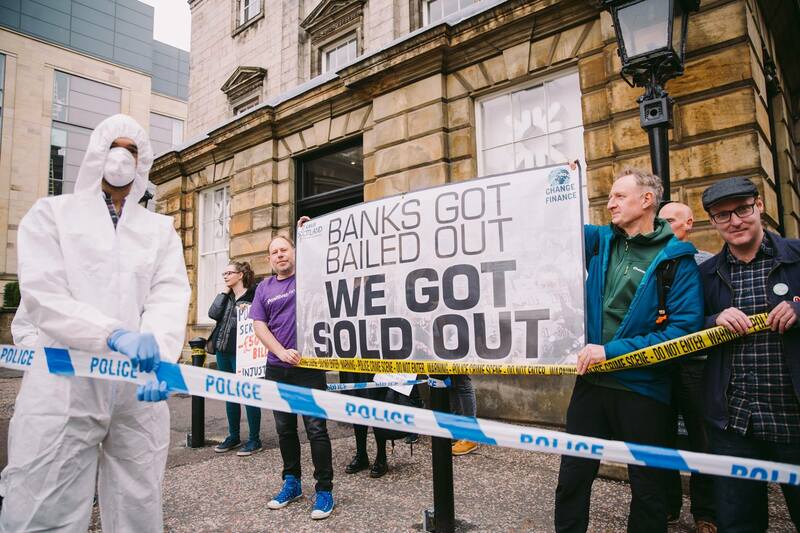 On 23rd September, the roadshow will be in Edinburgh, and the robots will be there to say no to TTIP! More photos here, and here and here!! If you want to get involved, please email activistsassemble@gmail.com! 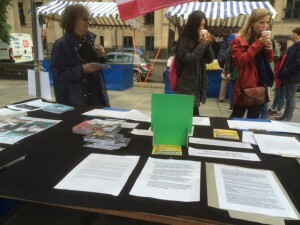 And please write to your MP here to demand full transparency on the TTIP negotiations and to protect democracy, public services and the environment by opposing this aggressive new trade deal. 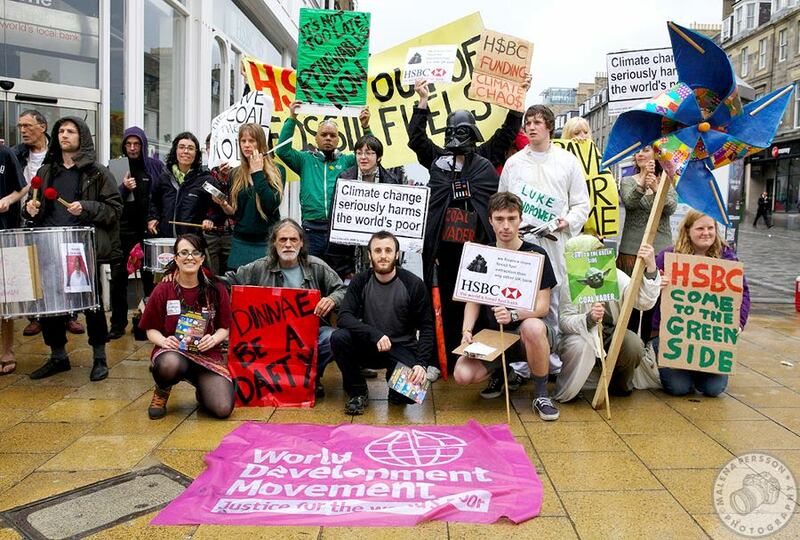 Star Wars Themed Coal Mine Protest! [Read more…] about Star Wars Themed Coal Mine Protest! 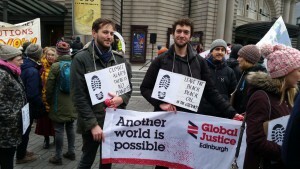 Global Justice Edinburgh activists host monthly meetings and regularly hold social events alongside these. 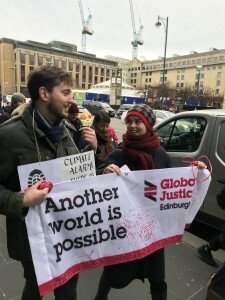 New members are always very welcome and if you'd like to come along to our next meeting then please feel free to contact us at gjnedinburgh@gmail.com for more info!